Thanks to Professor Keiichi Namba for hosting this course. teaching assistants Tatsuya Ibuki, Akihiro Kawamoto, and Fumiaki Makino. Lead Instructor: Eric Martz, Ph.D.
5.0 Å Poor -- backbone blurry; sidechains not clear. Ribosome with 3 tRNA's and mRNA (Help) from Wayne Decatur's 3D Ribosomal Modification Maps. PDBLite.org Simple, one-slot search. Clear help. OCA (developed by Jaime Prilusky at Weizmann) Powerful and straightforward. One-slot search at main page, pdb.org. Or click Advanced Search at pdb.org Powerful but sometimes difficult to use; help is often inadequate. Compare with Jmol by itself, for example under Display Options at the Protein Data Bank. Jmol's built-in Menu and Console. Many others: home pages. Comparison of Protein Explorer, Cn3D, DeepView: Martz, 2003. If the sequences in the ConSurfDB result include too many molecules of different functions (here is how to find out), refine the result with the ConSurf Server: consurf.tau.ac.il. Here are instructions in Proteopedia. Probable Quaternary Structure Server: Specific Oligomers. 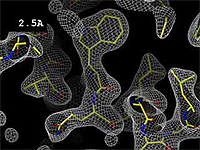 Great for journal supplementary materials or research group websites as well as molecular structure tutorials. 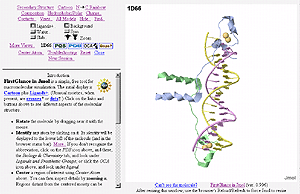 The CE site cl.sdsc.edu/ce.html will align any two protein chains quickly and easily (but hetero atoms are discarded, and its database has not been updated since 2001).